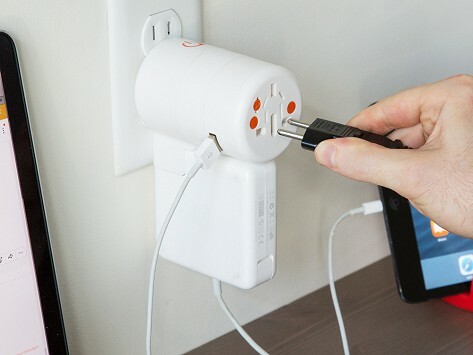 With a simple twist, this universal travel adapter works in 150 countries. Turn the base to find the right adapter and power up to four devices at once. TWIST Plus has two USB ports, an AC adapter for almost any plug, and a built-in MacBook charging port. Charge your devices with a single outlet, anywhere you are. Dimensions: 3.4" x 2.25" x 3"
Just returned and it worked as advertised and well! Just returned from two weeks in the countryside of Ireland and the city of London. Used the TWIST Plus World Adapter DUO in both locations and it worked well and as advertised. Only thing I didn't like was that it "felt" a bit poorly made even though it worked just fine. Also the documentation was pretty bad as it doesn't explain anything about using diagonal plug prongs and/or the orange things on the back which I still don't understand what they do. Overall, great product and for the price it's fantastic! We bought 2 of these and used them in Europe (Spain and Greece). They are so handy, and work great. It saves having to have a charger and all the loose adapters ; these are all together in one bundle. My only comment would be to have a little extension available somehow to adapte to a European country that has the long 2 prong adapter. Some sockets are very loose and the unit rather heavy for such sockets. When you add a plyg or extension to the USA side, the whole unit tilts and possibly slides out. How about some sort of thread extension on European side that would hold it to the socket at the proper 90 degree angle. When traveling overseas, charging your phone is crucial. But knowing what adapter you’ll need is almost impossible. With the TWIST, you’ll have the right adapter, wherever you are. 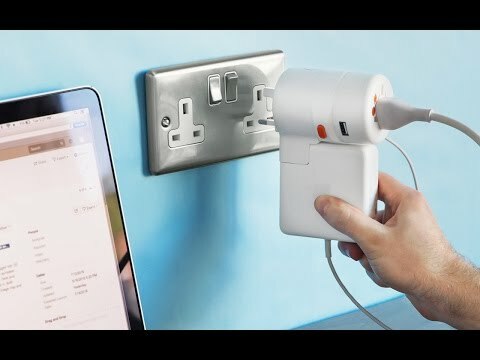 This universal travel adapter works in over 150 countries—just twist the base to raise the adapter you need. The TWIST can power three devices at once, with two USB ports and a universal AC outlet. The TWIST Plus has all of that, as well as a built-in Macbook charging port. Outlet-stingy hotels were a problem for Founder Michael Ma. During a work trip, he and his coworkers used all the outlets in their rooms and the lobby just to charge up. Michael wanted an adapter that worked all over the world and had multiple charging ports, too. Years of planning and prototypes created the first TWIST World Adapter. This adapter lets you travel a little smarter and a little lighter—charge around the world with a TWIST.